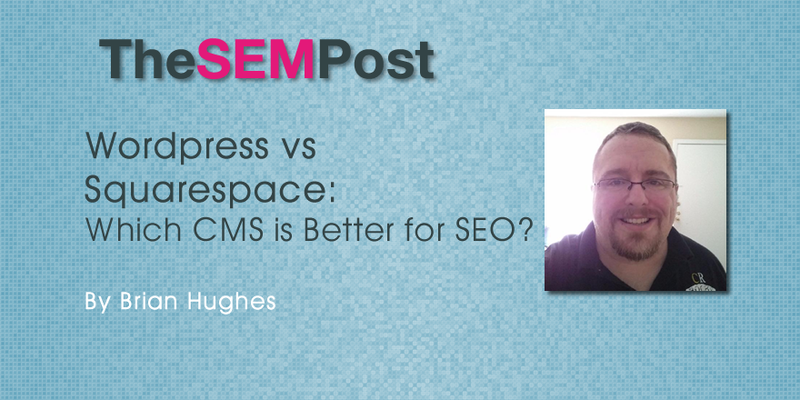 You are here: Home / SEO / WordPress or Squarespace: Which CMS is Better for SEO? Sitemaps, site title descriptions, and search engine descriptions are baked right into the CMS, so there’s no need to find and install plugins. Squarespace even offers built-in integration with Google Analytics, so there’s no need to add your site tracking code as you would with WordPress. That leaves us with the million-dollar question: is WordPress or Squarespace better for small business SEO? How Much Does Website CMS Impact SEO? WordPress SEO: Yay or Nay for Plugins? WordPress is the most Google-friendly CMS platform. It’s made from open code (which Google loves), it’s affordable and reliable, and it’s got a wealth of plugin options for managing everything from A/B testing to social shares. With WordPress, SEO plugins will put you in full control of your site’s architecture and HTML. You manage key HTML features including page titles, descriptions, and headers as well as site architecture and “crawlability”, the ease with which a search engine can crawl pages on a site. WordPress plugins like Yoast SEO have long set the standard for on-site search engine optimization. In fact, SquareSpace founder Anthony Casalena even stated in a Quora forum that his company actually scans the top WordPress plugins regularly as inspiration for SquareSpace’s SEO. With WordPress, you have the potential to get the very best SEO optimization first. That said, you will need to spend a little time researching the right plugins, downloading these plugins, and installing them. With Squarespace, you’ll have a whole team managing this process in the background for you. Squarespace: Giving Up Too Much SEO Control? Are you more of a ‘set it and forget it’ type of person? If so, Squarespace may be a better fit for your on-site SEO needs. If you’re new to the SEO world, it can be tough knowing which SEO tactics are most critical for your site. Squarespace makes it easy by helping you design beautiful web pages that are ready to go on mobile devices, too. (Responsive design means one less SEO issue to worry about!) Squarespace’s numerous SEO friendly templates have many of the best SEO practices already baked in, including sitemaps. However, it’s also worth noting that Squarespace is not a self-hosted option, which could potentially lead to advanced optimization issues down the road. If you’re already familiar with many SEO basics and feel confident in your WordPress customization capabilities, even Rand acknowledges that WordPress can – when fully customized – exceed Squarespace. Additionally, some Squarespace users complained in 2015 about difficulties adding the meta description tag in the custom code area. Moz forum users as recently as November 2015 noted that implementing the meta description tag continues to pose problems. In the same forum, Rand Fishkin also commented that his original endorsement of Squarespace is from almost two years ago, implying the platform may have changed since his endorsement was made. He goes on to say that while he did not have the same issue with meta description tags, if this is a problem, Squarespace does need to fix it. I bring this exchange up as an important example of how an endorsement of a product should never be construed to imply the product is perfect, or that there won’t be any SEO issues. In terms of the WordPress versus Squarespace debate, if you prefer a self-hosted option with total control, WordPress may be a better solution. WordPress sites are free to users who provide their own hosting options and domain name. Hosting fees can vary widely depending on the host provider, but as a general rule of thumb, a reasonable annual estimate falls between $5 to $10/month. For comparison purposes, Bluehost charges $6.95/month for its standard hosting plan (although discounted promo rates are often available) and Hosting Gator offers a starter plan at $5.97/month for managed WordPress hosting. You’ll also need to factor in the annual domain name charge; Bluehost, for example, charges $15.99/year. Assuming you used Bluehost for your domain name and hosting, that brings the yearly charge to just shy of $100/year. Squarespace pricing is similar. After a 14-day free trial, you’ll need to choose between an annual billing charge or a month-to-month charge for your website. Squarespace also offers two types of packages. The personal package is a basic website with up to 20 pages/galleries/blogs, powerful website metrics, 24/7 support, and fully integrated e-commerce. The business package is similar, but with unlimited pages/galleries/blogs and a lower sales transaction fee. You’ll also get a professional email account (something you would be able to set up for free with WordPress self-hosting, but not with Squarespace), pay a lower sales transaction fee, and score $100 in Google AdWords credit. (As an aside, many WordPress hosting services also offer AdWords credit). The annual cost for a personal site is $96 with a yearly plan and $144 with a month-to-month plan. The annual cost for a business site is $216 with a yearly plan and $312 with a month-to-month plan. For a robust business site, the cost is nearly triple a WordPress site. However, for a basic personal site, the costs are virtually the same. When deciding between WordPress or SquareSpace, SEO is an important consideration and it’s natural to feel a bit overwhelmed by these two different options. A simple rule of thumb I use: if you’re not comfortable managing plugins or brand new to SEO, Squarespace will cover all your SEO bases without a steep learning curve. However, if you already like the WordPress environment, the plethora of plugins will be more than sufficient for your SEO needs. Either way, remember that on-site optimization is just one part of SEO. Great content, authoritative links, and social shares/reputation are equally important (if not more so) when it comes to successful SEO. Are you a diehard fan of Squarespace or WordPress? Weigh in on the debate below! WordPress wins hands down. You can do so much more with wordpress now days i challenge any one with a square space platform to make their sites work as good as a square space site with regards to layout, SEO, features and fine tuning seo. Then look at things such as revision control and backups. You cant do it easily or practically with squarespace. There are MANY MANY more reasons but those who dont understand business web development often are sucked in to what they think is the better option. As for SEO? Just install yoast and instantly you have a superior SEO guide for no cost…. there are many other reasons as well.